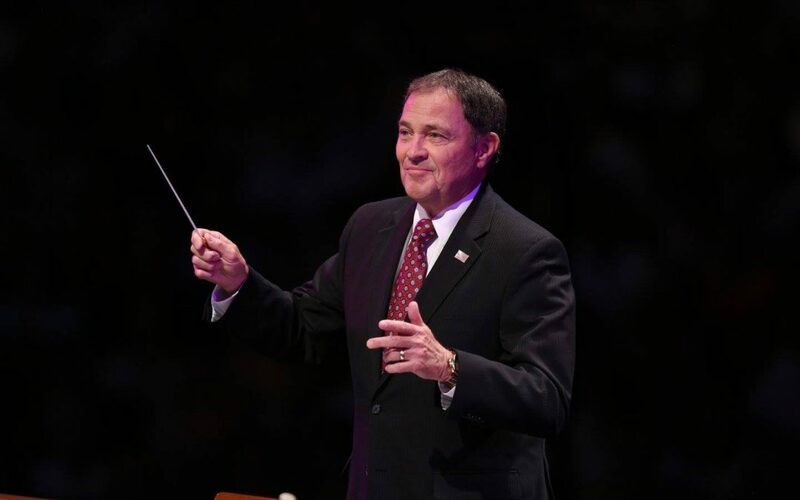 Utah’s Governor Gary Herbert became the first governor of Utah to every conduct the Mormon Tabernacle Choir during a live performance. The event took place at the choir’s Pioneer Day Concert on July 15, 2017. The Mormon Tabernacle Choir has had many guest conductors in the past and have a history of inviting leaders from around the world to lead the choir. Herbert will be remembered as the first Utah governor to ever have that honor. He conducted the choir in a rendition of “This Land Is Your Land” at the annual Pioneer Day Concert. Most everyone here knows that the great State of Utah is celebrating the arrival of a small group of pioneers who arrived in this valley 170 years ago this coming Monday. And I’m sure you also know that the man who led them—and the thousands who followed—was soon appointed governor of the Territory of Utah. Now, for all of Brigham Young’s accomplishments and accolades, he was never invited to conduct the Mormon Tabernacle Choir, which is a long-standing tradition the Choir has as it tours around the world … inviting renowned leaders to join us on stage as guest conductors. And, for that matter, no governor of Utah since Brother Brigham has ever been accorded that honor. But, tonight, we’re changing that, as we’ve invited the governor of our great state, Gary Herbert, to take over at the podium and conduct the Choir and Orchestra in one last number … for each of you.